Domaine de Bonserine does not have a long history in Cote Rotie. The Northern Rhone Valley estate was founded in 1972 by Alfred Gerin, along with an American partner/investor. In 1989, Alfred Gerin left the property to help found Jean Michel Gerin. Today, Domaine de Bonserine is owned by Ets. Guigal, who purchased the estate in 2006. Domaine de Bonserine is situated in the north of Cote Rotie in Verenay, just a bit northeast of the town Ampuis. After Guigal took over Domaine de Bonserine, they made a serious financial commitment to update the winery, replant parts of the vineyard and produce the best wine possible. They built a new, state of the art cellar with temperature controlled, stainless steel tanks. Much of the wine is now aged in 600 liter demi-muids, instead of smaller, standard 228 liter barrels. Domaine de Bonserine owns 10.5 hectares of vines in Cote Rotie, making de Bonserine the second largest vineyard owner in the entire Cote Rotie appellation. The vines are planted in some of the best terroir in the appellation on both the Cote Blonde and Cote Brune. Some of the vines they have are placed in the Cote Blonde, Les Moutonnes, La Vialliere, Le Champin, Leyat, Fongeant and the Planeze lieux-dits. With their 10.5 hectares, they are the second largest domaine in the appellation. The terroir is mostly steep hillsides with iron-rich schist and mica soils. All their work in the vineyard is done on a sustainable, farming basis. No chemicals, pesticides or herbicides of any type are ever used. 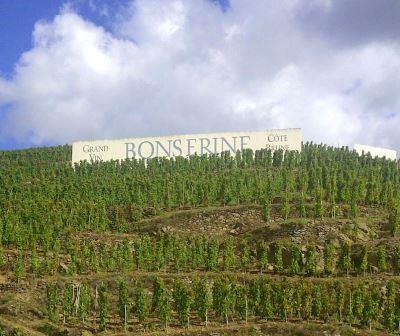 Domaine de Bonserine currently produces 4 Cote Rotie wines and a Condrieu from 1 hectare of vines. Domaine de Bonserine la Garde – From 100% Syrah from vines that range in age from 60 to 80 years of age planted on the Cote Brune, with just a touch of fruit from the Cote Blonde. For this Cuvee, they use .08 hectares of vines. 80% of the berries are destemmed. The wine is aged in new, small French oak barrels for up to 36 months. La Garde is the smallest production made at de Bonserine, as on average, about 250 cases are produced each vintage. Only 250 cases are produced here each vintage. Domaine de Bonserine la Sarrasine – From a blend of 97% Syrah and 3% Viognier, the grapes are 100% destemmed. The wine is aged in 80% new, demi-muids for up to 24 months. The wine made its debut with the 1999 vintage. On average, between 2,000 and 2,500 cases are produced each year, making this one of the most widely available, high-quality wines from all of Cote Rotie. Domaine de Bonserine la Vialliere – From a blend 95% that ranges from 95% to 97% Syrah and 3% to 5% Viognier. This single vineyard wine comes from vines planted entirely in the la Vialliere lieu-dit. They own 1 hectare of vines in the lieu-dit. The vines were planted in 1995, so they are just now starting to come of age. The wine is made from grapes that are 95% destemmed. The wine is then aged for 24 months in 100% new, 640 liter demi-muids. The production is quite small as the average vintage produces about 350 cases of wine each year. Domaine de Bonserine Cote Rotie is their young vine cuvee made for early drinking pleasure. The wine is not produced in every vintage. So far, it has only been produced in 2012, 2014 and 2016. Domaine de Bonserine, when young, should be decanted at least 1-3 hours, give or take, allowing the wines to soften and open their perfume. Older vintages might need very little decanting, just enough to remove the sediment. Domaine de Bonserine is usually better with 7-10 years of cellaring and should be at its best between 9-20 years of age. Domaine de Bonserine is best served at 15.5 degrees Celsius, 60 degrees Fahrenheit. The cool, almost cellar temperature gives the wine more freshness and lift. Domaine de Bonserine is best served with all types of classic meat dishes, veal, pork, beef, lamb, duck, game, roast chicken, roasted, braised and grilled dishes. Domaine de Bonserine is also good with Asian dishes, hearty fish courses like tuna, salmon, mushrooms, cheese and pasta. Condrieu, the white wine of Domaine de Bonserine is best served with a myriad of different seafood dishes, shellfish, crab, lobster, sushi, sashimi, chicken, pork and veal, as well as Asian cuisine. Over the years, Domaine de Bonserine has produced at least 3 Cote Rotie wines that are no longer being made. Domaine de Bonserine Cote Brune is no longer produced. Domaine de Bonserine de la Rousse is no longer produced. Domaine de Bonserine les Moutonnes is no longer produced. The last vintage was 2001. Fresh, elegant and richly textured, the wine is juicy, vibrant and refined. The red fruits show purity, sweetness and lift. Just a touch of the 100% new oak remains, as most of that is already fully integrated into the wine. Earth, herbs, smoke, thyme and dark red berries are in the right place. Luscious, silky and fresh, the wine is full bodied, sweet and spicy, with lift and elegance in the finish. Give this just a few years and it will show even better. Floral and black cherry notes pop once the cork is removed. From there you find licorice, smoke, thyme and peppery, red berries. On the palate, the wine is forward, lush, sensuous and fruity, with sweet, red, round, black cherries and a peppery bite in the end note. This is already delicious to drink! Young, fresh, clean, pure, sweet, cherry, spice and floral notes in the perfume, lead you to a bright, elegant, silky textured wine, with a kirsch, black raspberry and thyme centered finish. This should develop nicely. Medium/full bodied and still young, it took air and coaxing for the floral, earthy, peppery, red fruit nose to emerge. Soft, fresh, crisp cherries, thyme and black raspberries are found in the spicy finish. Soft, sensual, round textures, a bouquet studded with fresh sweet cherries, flowers and earth with a juicy, refreshing mouthful of black raspberries in the finish. This is drinking great today with its soft, supple textures, sweet, fresh, earthy, spicy cherries, black raspberry, flowers and thyme. On the palate, this really shines with the perfect blend of freshness and sweetness that hangs in there, through to the red fruits in the finish.